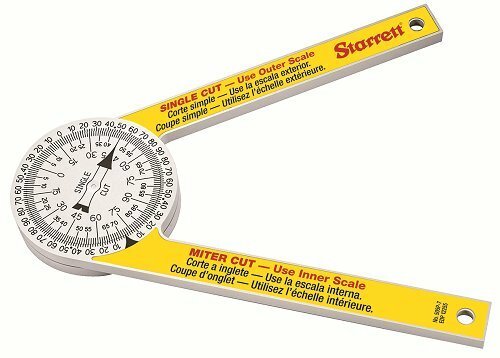 Legendary Starrett accuracy takes error prone calculations out of the process of setting up miter cuts. Simply set your saw to the angle that you read on the protractor. 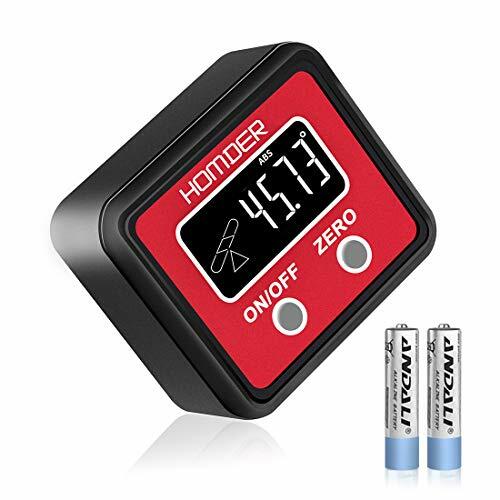 Homder Digital Angle Gauge Level Angle Finder is great for precision angle measurements. It's small and light, it is real easy to be carried and used. Designed for calculating in Car repair/Home decoration/Medical industry/Timber processing /Instrument detection/Machine made and etc. 30 Days Money-back Guarantee and 18-month Warranty. Please feel free contact us If you have any questions. We will offer you satisfactory solution within 24 hours. High Accuracy and Quality The Digital Angle Finder with 0 to 360 (4*90 ) measuring range ,Resolution: 0.01 ,Accuracy: 0.1 at 0 and 90 , 0.2 at the rest angles,Measures angle in (degrees).It helps your work more easier. Upgraded LCD Display It is more easier and clearer to read the values even work at night,because Upgraded LCD Display with new black-light white characters function.what more,LCD Display with a Low battery indicate. V-Groove magnetic design Digital Protractor can firmly attaches to curved metallic pipe,also can firmly attaches to any metallic surfaces(tables, fences, blades),but the older-level box can't do it. 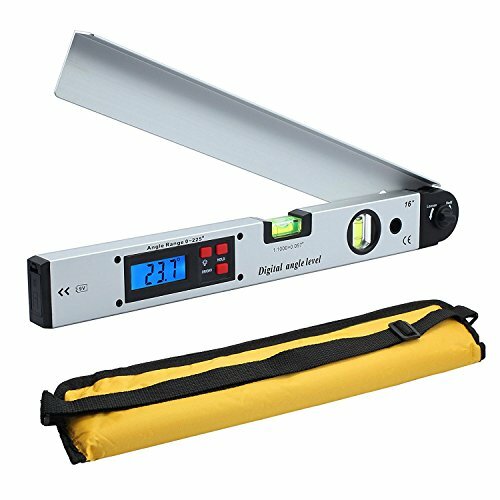 Easy to use Digital angle gauge only 2 buttons.The zeroof button can set Zero function at any angle,the other is on/off button.Easy to use, easy to operate. Auto Power Off Digital level box is operated by 2pcs AAA LR03 batteries(included) and will automatically Turn Off after 5 minutes of no operation. This highly accurate digital angle finder offers easy-to-read measurements via a large LCD display and has an 8" stainless steel blade and steel locking knob. 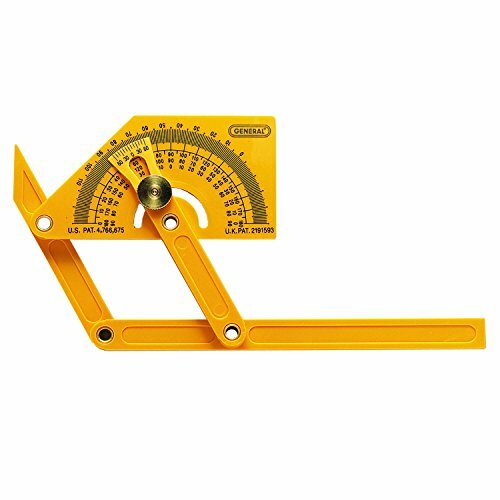 It is ideal for measuring, storing and transferring inside and outside angles when building cabinetry, furniture and picture frames. 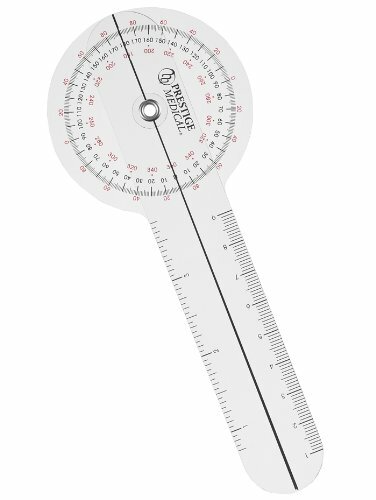 The General Tools 828 Digital Sliding T-Bevel Gauge & Digital Protractor in One offers pioneering technology that takes the guesswork out of angle duplication and eliminates the problems associated with manual measurement transfer. Range: 0 to 360 Accuracy: 0.3 Resolution: 0.05 Blade length: 8 in. GENERAL TOOLS - THE PRECISE TOOL FOR DOING THE JOB EXACTLY RIGHT. Offering over 1,000 tools, we re proud to provide tradesmen, craftsmen and DIYers around the world with a broad range of affordable, specific-purpose mechanical hand tools and precision measuring and inspection tools. For inquiries, please contact our Customer Service Department at 212-431-6100. We strive to provide our customers with 100% satisfaction guaranteed. 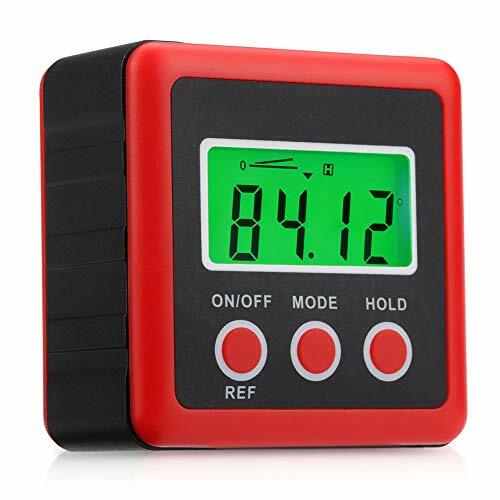 TRANSITIONAL DISPLAY - Digital angle gauge has a reverse display button and flip display button with a locking knob for manual measurement transfer. Full LCD display with large digital angle readout. A goniometers primary purpose is to assist in physical therapy by determining the range of motion of a joint. It's an easy way to gauge recovery after surgery or physical therapy. EASILY DETERMINE RANGE OF MOTION - A goniometers primary purpose is to assist in physical therapy by determining the range of motion of a joint. It's an easy way to gauge recovery after surgery or physical therapy. AN ESSENTIAL TOOL FOR TREATMENT - A goniometer is an essential tool for anyone who works in or is going through physical therapy, sports therapy, or a rehab program following surgery or an accident. TRANSPARENT FOR EASY READINGS - The clear plastic of the goniometer allows you to place the device directly on a joint or limb for easy observation. CLEAR ISOM DESIGN - The easy to read 360 head features three scales to allow for a variety of readings. The arm's ruler features both inches and centimeters. Accuracy 0.3 means the measurement may be bigger or smaller than real angle by 0.3 degree. The stainless steel ruler edges are sharp and dangerous.Users may get hurt from it if not careful. PLEASE STORE IT IN SAFE PLACE AND DO KEEP IT AWAY FROM CHILDREN. 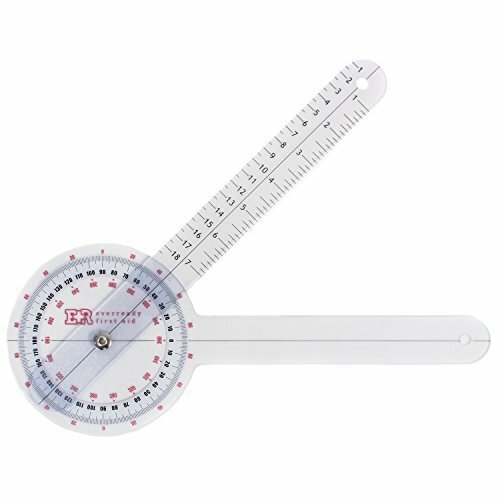 Ruler and protractor combination for easy measuring. Durable stainless steel body provide years' using. *Stainless steel edge is sharp, please be cautious while using AND KEEP IT AWAY FROM CHILDREN. Quick and clear digital readout. Accuracy 0.3 . Total length 400mm. Display resolution 0.1 degree. *The display could not read up-side-down. No reverse angle measurement. *SCRATCHES ON RULERS ARE RESULTED FROM TOUCHING WITH EACH OTHER. IT MAY APPREAR ON BRAND-NEW PRODUCT. 700 features: -magnetic angle locator. -High-impact molded body. -Helpful for setting machine angles or for obtaining any angle. -Convenient metric rule on one edge, and English rule on the other. Product type: -rulers. Generic dimensions: -10. 5'' H x 6. 19'' W x 1. 88'' D. Dimensions: overall length - Side to side: -6. 19 inches. Overall height - top to bottom: -10. 5 inches. Overall depth - front to back: -1. 88 inches. Overall product weight: -0. 46 pounds. 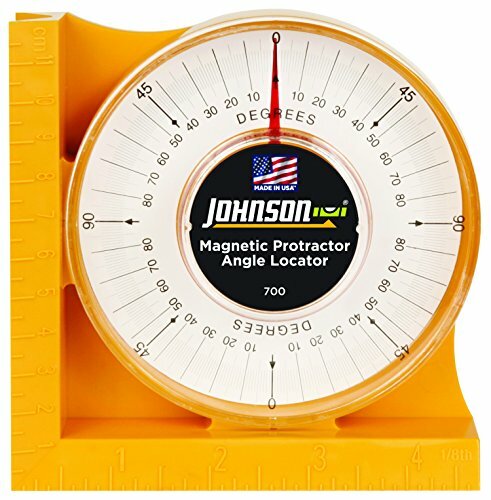 The Johnson Level & Tool Magnetic Angle Locator is designed for plumbing, electrical, or HVAC work that demands strong, magnetic contact with pipe, conduit, or other ferrous surfaces for accurate angle identification. It is built for durability and easy use, with a high-impact, plastic body in high-visibility orange and a clear, acrylic lens with easy-to-read increments in 0 to 90 degrees in 4 quadrants. Its V-grooved edge accommodates pipe and conduit, and it features an extra-strong, permanent ceramic magnet. The angle locator includes convenient metric rule on one edge and English rule on the other. It is covered by a 1-year limited warranty. Miter Saw Protractor replace the model #505P-7 for carpenters, plumbers and all building trades also invaluable for home use and do-it-yourselfers. set your saw to the angle that you read on the protractor. Upside down or backwards, the reading is always correct. The easy-to-use tool has two scales. The Miter Cut Arrow and Inner Scale indicate the exact miter saw setting for an accurate miter joint every time. The Single Cut Arrow and outer scale indicate the exact miter saw setting for fitting a single piece to an angle. Miter Protractor "O" ring insures smooth and precise operation, takes error-prone calculations out of the process of miter cuts. General Tools 17 Square Head Protractor is an essential tool for students, machinists, carpenters and woodworking hobbyists. 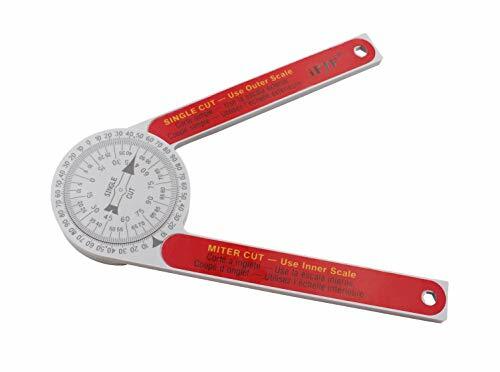 Constructed of durable stainless steel, the protractor with its 6" adjustable arm is ideal for setting bevels, taking measurements and transferring angles. The 3-3/8 x 2 head makes it possible to anchor the protractor against objects to hold it in place as you take measurements. 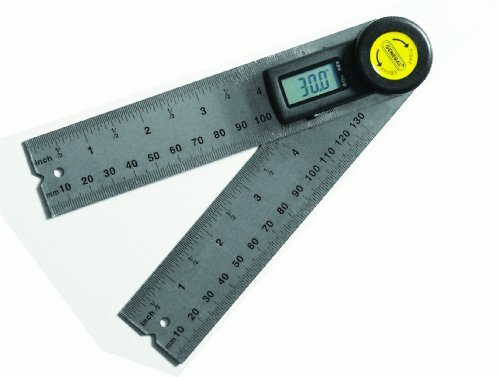 This square head protractor has a 0 to 180 semi-circle scale in forward and reverse directions to measure all angles. 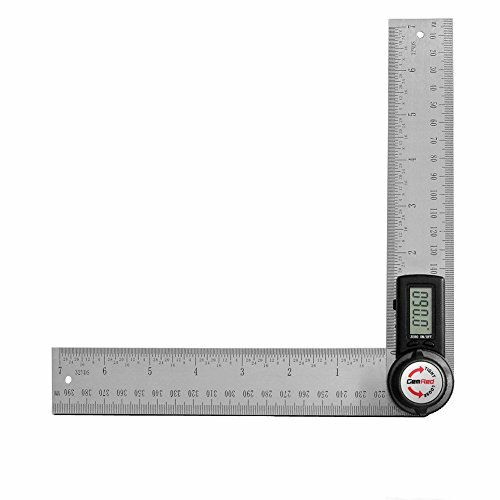 Measure an angle with the small stainless steel arm which glides smoothly for precise alignment. Use the knurled thumb nut to lock the arm into place as you take measurements. Its stainless steel construction gives it strength, durability and the ability to resist rust. INSIDE, OUTSIDE AND SLOPED ANGLES - this plastic protractor/angle finder measures inside, outside and slope angles. You can depend on expert, precision centering on your work stock with the POWERTEC 71081 center Finder. This handy devise allows you to quickly and easily pinpoint the exact center of Circular, square and octagonal-shaped stock (sized up to 8") and hexagonal-shaped stock (sized up to 5-3/4"). time consuming measuring and inaccurate estimating will be a thing of the past with this effective and efficient accessory. Enjoy the satisfaction of creating impeccably symmetrical woodwork with this ingenious accessory. Its lightweight construction of rugged, impact-resistant plastic makes for easy usability and long-lasting durability. In addition, the clear quality of the plastic insures optimal visibility. The center Finder features two v-stops, one on either side, for enhanced versatility. The 60-degree v-stop is ideal for Circular shapes, and the 90-Degree v-stop is great for square, Octagonal, hexagonal and Circular shapes as well. Simply set stock firmly against the V- stop of the device, and score your first line using the Straightedge guide, rotate stock 90-Degrees and mark your second line. The point where the perpendicular lines cross reveals the true center. To center ovals and rectangles, simply adjust the workpiece higher up on the v-fence to accommodate for the longer side of the shape when scoring the perpendicular line. Efficient and effective, the POWERTEC 71081 center Finder streamlines your workflow and enhances your project outcome. It's a wood Turner'S dream but is also ideal in a wide variety of woodworking, jewelry-making and piping applications. EMI 3 Piece Gonio Set The head of these goniometers feature 360 degrees of coverage in 1-degree increments to ensure ISOM (International Standards of Measurement) accuracy. Measurements in inches and centimeters are on the arms. The clear plastic permits observation of the joint's axis of motion and range of motion. 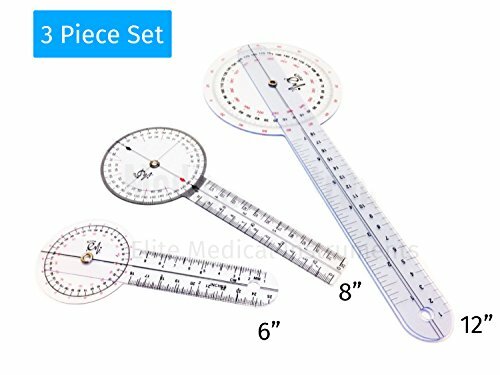 You will receive one 12" goniometer , one 8" goniometer, and one 6" - 3 Pieces total! 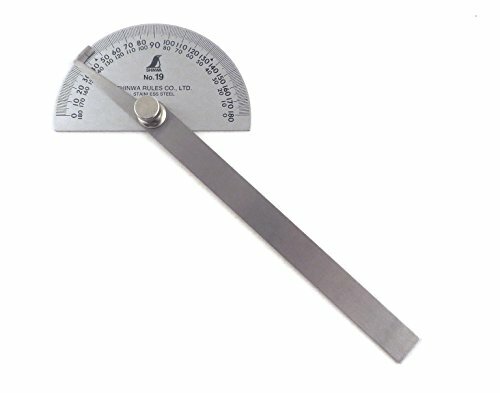 This is a new Shinwa stainless steel 19 protractor. Overall length is 8". Base is 3 wide by 2 tall. Markings are deeply etched and black filled for easy readability and long life. 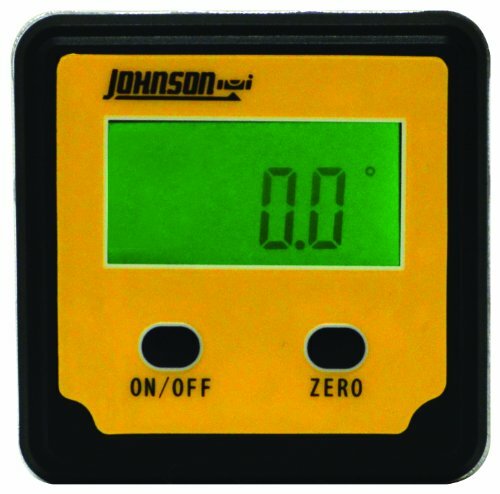 ZERO FUNCTION AND LEVEL FUNCTION -- inclinometer or tilt gauge to set or check relative angles between surfaces(You can hit the on switch to set the current angle of zero and them measure the total stroke of the angle finder. ), also works as true digital level for tight spots. STRONG MAGNETIC BASE - Magnetic base quickly and easily attaches to aw tables, fences, blades and other metallic surfaces; reversible display inverts when gauge is upside down. 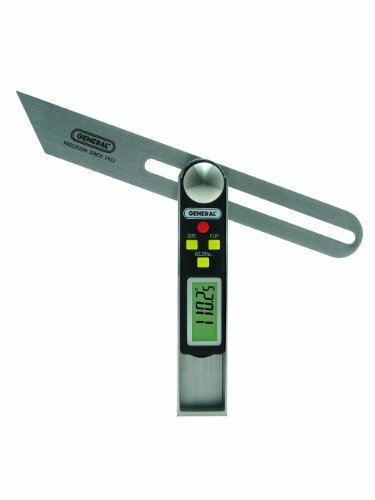 HIGH ACCURACY AND FOUR MEASUREMENT MODES- Use as mini digital protractor, displays bevels in degrees, IN/FT, mm/M, percent slope.It provides precise measurements, whose accuracy is 0.1 at 0 and 90 degree, 0.2 at any other angles. 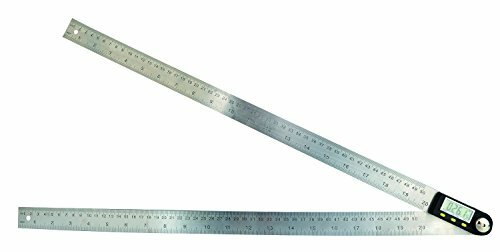 Ruler made of stainless steel for durability, Could be well used into various fields besides of Angle ruler, Straight ruler and Square Ruler. For variable, precise measurement and transfer of angles from 0-360 . With LCD display for reading measurements easily, Total length 400mm. Can be reset to zero in any position, Ruler with mm / inch scale. Includes battery / includes instructions for use. 6" Protractor Goniometer. 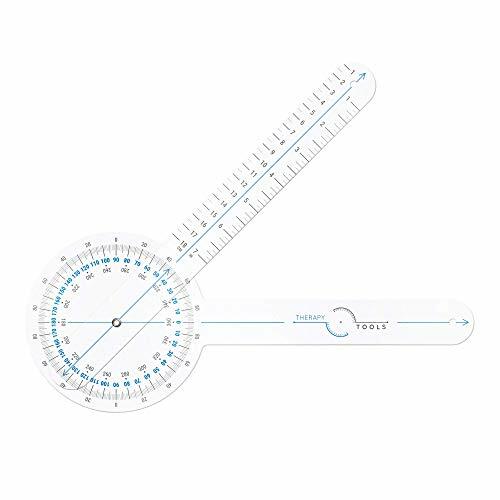 This protractor goniometer is designed to measure the range of motion in a patient's joints. Measures a full 360 degree range in single degree increments. This protractor goniometer is designed to measure the range of motion in a patient's joints. Measures a full 360 degree range in single degree increments. 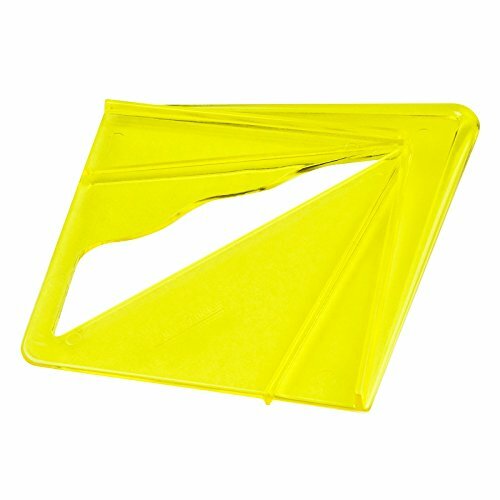 Made of heavy-gauge clear plastic for greater durability. 6 inch size. With a mixture of quality, style, usability and improved reliability it will serve you well in school or clinical settings ! Made of CRYSTAL CLEAR ACRYLIC; its high ridgidity resists warping! HIGH VISIBILITY font, color and size creates INCREASED RELIABILITY of your measurements and clinical outcomes. Use on all the major joints in the body as well as of the cervical and lumbar spine's. Lifetime Warranty : We stand by our products! If you are not satisfied with our product simply return it for a full refund. Therapy tools, LLC is a veteran owned small business entity motivated on improving clinical outcomes and usability for our patients and colleagues. WE ARE LISCENCED AND PRACTICING PHYSICAL THERAPISTS and understand your needs! CLICK "ADD TO CART" right now and order yours today! ENHANCED COLOR - Colors designed for improved speed, accuracy and visibility when used against a variety of different skin tones. Magnetic digital angle locator is made with a solid construction and ideal for woodworkers, astronomers, electricians, machinists, Plumbers and homeowners for all leveling projects such as hanging pictures and mirrors. Features a 2 button design, magnetic base, automatic LCD backlight and an automatic digit inversion for overhead measurements with angle display in degrees. Contains a working range of angle measurement 4x90 degrees.